Brooke and Mike had been dating for three years. It was inevitable. We were getting a new son-in-law. So, when they came to us the Christmas of 2006 and told us the good news my husband and I were prepared. Brooke, our youngest, was the only baby in our family to be brought home from the hospital to this home which has been in the Ramsey family since 1950 when it was built by Brooke’s grandparents, Robert and Hilda Ramsey. 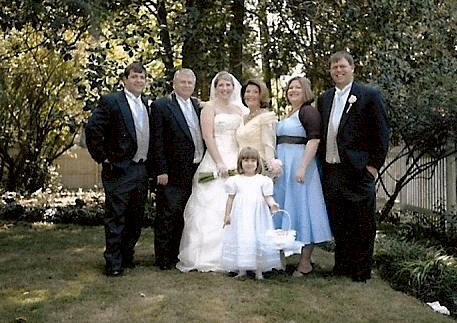 My husband, Joel, moved in when he was four years old, the same age as our oldest daughter when his parents moved to a smaller home and we moved in. We are now at an age when scaling down seems like a good idea so when she requested having the reception (if not the whole wedding) in our garden, we decided this occasion would be an appropriate swan song for this lovely home and our family. Before doing anything else…I recommend that you buy a desk calendar with room to fill in appointments and contact numbers. Get two notebooks one for the bride and one for the mother of the bride. Keep samples in these notebooks so you will not be in doubt as to colors when you go to buy ribbon, etc. Telephone numbers of the vendors for your event should always be at your fingertips. Make notes as you interview people. Write specific prices down as well as exactly what each vendor is providing and what your responsibility is for that task. If you have a computer and printer use your excel program to list items with prices and print off a copy for you and your vendor that you both sign off on so you are both on the same page. Make sure dates and times are clarified. Include the church as a vendor. Each service and part of the church you use will probably have a cost and a time you are allowed to use it. 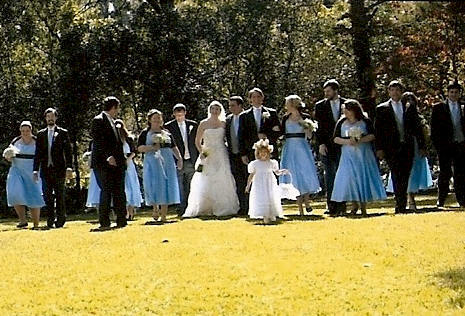 Each service (security, clean-up, wedding director, videographer, sound, etc.) will have a fee. List items the church has that you will use (altar table, kneeling bench, etc.). We reserved the Fellowship Hall of the church as a fall back venue for the Reception. By reserving this we also had access to it on Friday night. The Groom's family took advantage of this by holding the After Rehearsal Party there. This was convenient for all...the groom's father (who is also a pastor) officiated for the wedding. After the Rehearsal we simply shifted down to the Fellowship Hall for a delightful supper prepared by the parents and Andrea, the groom's sister and a bridesmaid, and her sweet friend, Joy Cowart,. Joy is also a caterer and made the delicious cakes for the wedding. 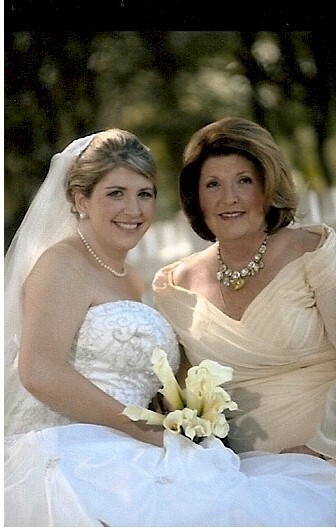 As the mother of the bride, one of the first things I did was to buy Brooke a book on how to write thank you notes. As gifts came in, Brooke wrote a thank you and that is one of the things people have commented on to me most...how gracious her Thank You Notes have been. I can attest to the fact that they were sincere. We appreciate all the love that comes with those gifts and the friendships and relationships they represent. 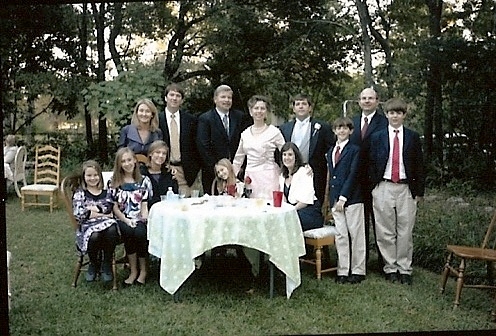 The first thing Brooke did was to invite some of her close friends and family members to be her bridesmaids. She called them and personally extended the invitation and then followed up by sending a special Bridesmaid's cookie as a sweet expression of thanks for their participation in her happy day. Being a member of a bridal party involves a significant expenditure of time and money. Of course in planning the wedding one must break down the elements. Southern weddings are different than northern weddings because the customs are a bit different. The same basic elements apply. 1. Budget—I sat down and divided the wedding into categories and set a limit on the amount we were willing to spend in the different categories. Brooke and Mike have been working and on their own for several years. They had their own money to supplement the budget when there were items they wanted to add to our basic list and budgeted funds. 2. 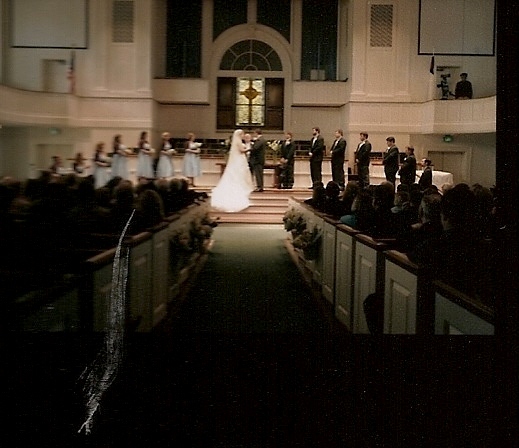 Venu—We hedged against the weather by having the wedding at First Baptist Church, the church where Brooke grew up. We reserved the Fellowship Hall in case weather dictated that we would have to go inside for the reception. In fact, this proved to be Providential because the Groom's family took advantage of our church Fellowship hall by holding the After Rehearsal Party there. It was convenient and appropriate for a large group of people. 3. Wedding dress—Brooke found "the wedding dress," perhaps the most important item of the entire wedding (after finding the groom), at Andrews Bridal Shop. It was (of course) more expensive than we had allotted, but was truly so beautiful we knew it was "the one." Online shopping and comparison helped Brooke decide there was no better price to be had for the dress she knew was the right one. 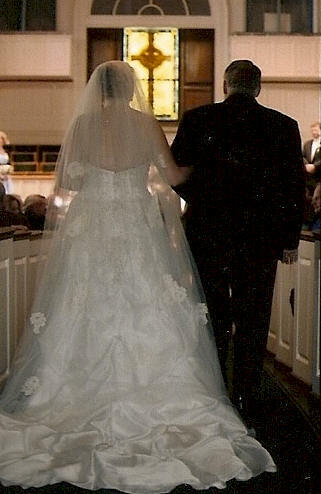 We had to keep the dress a secret because the prospective groom could not see it until the wedding day. After comparison shopping, the price at Andrews was the best and made it easy for Brooke to decide where to purchase her dress. Her wedding dress was "something new." 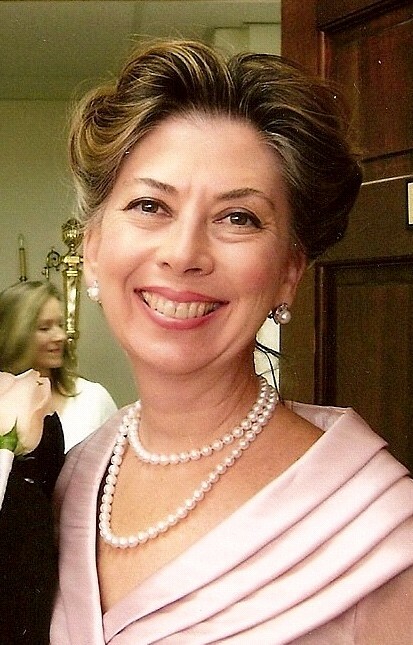 Her aunt, Dr. Patricia Prendergast Ramsey from New York, gave her a pearl necklace, and her aunt from New Orleans, my sister, Dr. Sylvia Burson Rushing, gave her pearl earrings. So those were the "something old." Take note of the veil. 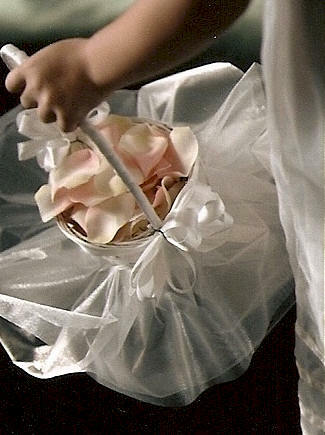 It was one I wore when I got married thirty-eight years ago (something borrowed). I bought her a blue garter (something blue). The guest list was immensely difficult. Southerners are very big on family, and friends constitute extended family. We have lots of friends and the thought of excluding someone is almost more than we can bear. That is one reason for deciding on having the Reception at home and in our garden. We could invite more people! We used Excel to formulate our list and could therefore manipulate the list as need be...(Group, First Name, Last Name, City, State, Zip code). 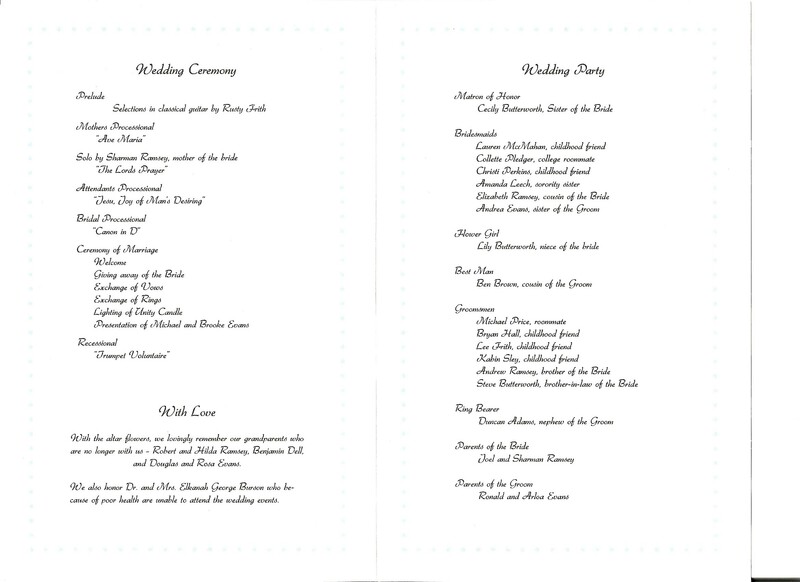 From the basic initial list we could "grab" the names and addresses of those who would be invited to the parties and showers. 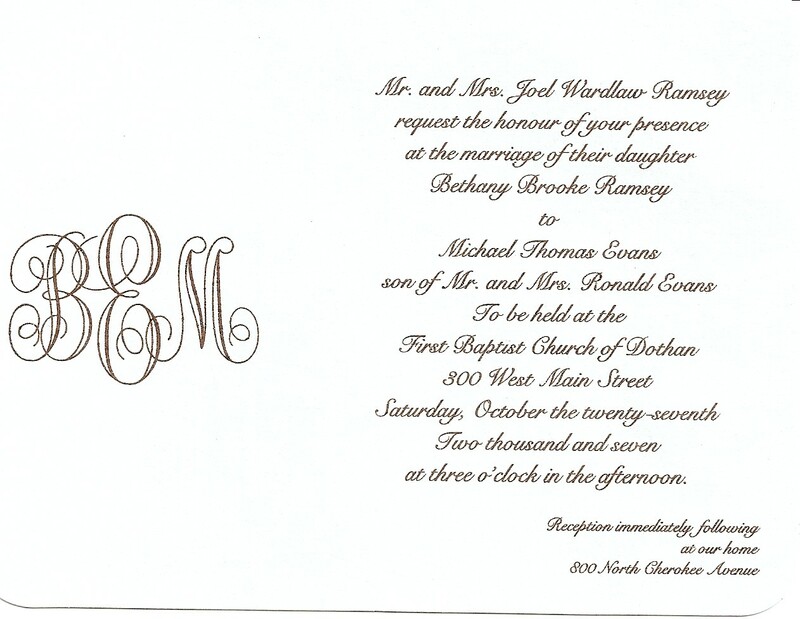 The invitations were blue with thermographed brown print; the enclosures were on a vellum that Brooke ran off on her own printer. The raised print of engraved and thermographed invitations is worth the extra money for the quality. 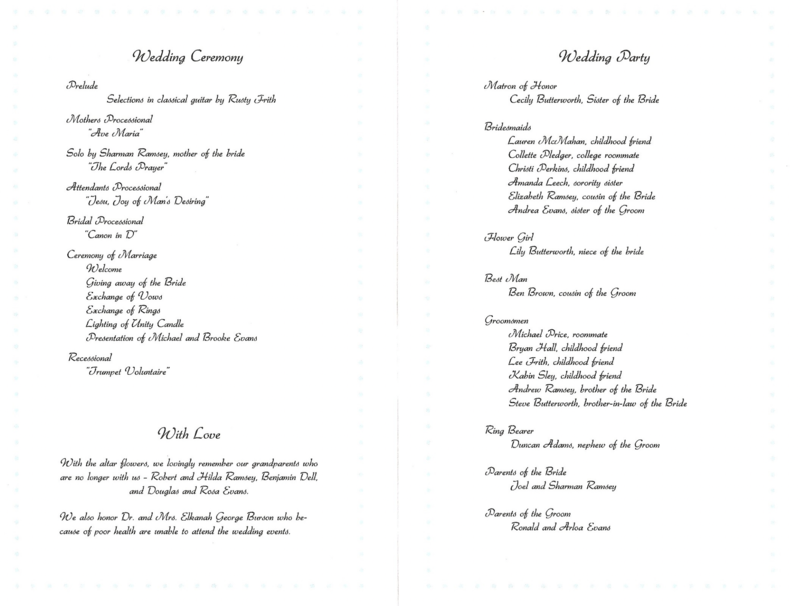 The invitations were ordered from an online website. Brooke took the time and extra money to order a sample of the card stock to make sure the quality felt good. Her extra efforts paid off. We got many compliments on the invitations which were elegant in their simplicity. Also, being a standard size and weight, the postage was no more than a regular letter. That is an important consideration when selecting an invitation. When one plans a wedding in the fall in the South, one must accept the fact that a football game trumps a wedding. The rule of thumb according to the caterers is to multiply the number you invite by two and divide by three. Now, in our modern internet savvy world, however, it is possible to RSVP online. We included an enclosure with the wedding invitation giving options for responding. 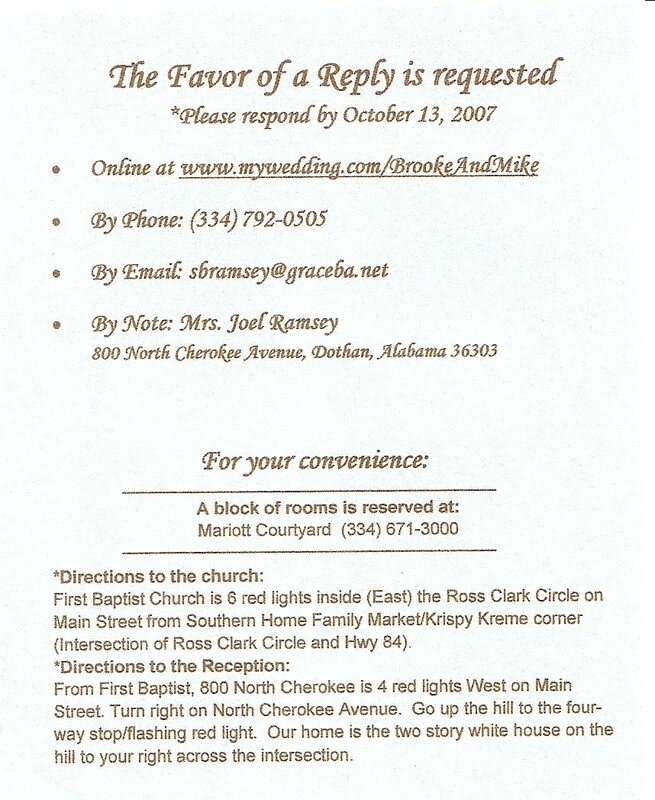 The choices were to RSVP online at My Wedding.com or our guests could respond by phone, by email, or by note. I recommend this highly as we were able to determine how many guests to tell our caterer to expect with a fair degree of accuracy. Brooke and I went to the RSVP page every day to see who had responded. This really helped make the anticipation so much more fun because we knew what a great bunch of people would be there to share Brooke’s special day with us and could look forward to the day with even more excitement. We did receive some lovely notes! We appreciated every note and comment attached to the responses. You invite people you care about to share special events with you. Their comments online and in their notes, mean a lot, as does the special effort those who love you make to share the most precious possession any of us have…our time. 5. Attendant’s dresses-- We are missing an attendant here, but as you can see, they came in all shapes and sizes. Try as she did, it is difficult to find a dress that is attractive on every girl. The pashminas, a gift from Brooke to her attendants, as were the necklaces, were an excellent addition to the outfit and helped solve the problem for those girls who felt their arms looked too big with this cut of dress. The girls from left to right are Collette Keener Pledger, Brooke’s University of Alabama roommate, Amanda Leech, Kappa Alpha Theta sorority sister and fellow Italy traveler, Cecily Ramsey Butterworth, matron of honor and sister, Elizabeth Ramsey, cousin of the bride, Christi Perkins and Lauren Peters McMahaon, oldest friends of the bride, and Lily Clare Butterworth, niece of the bride. 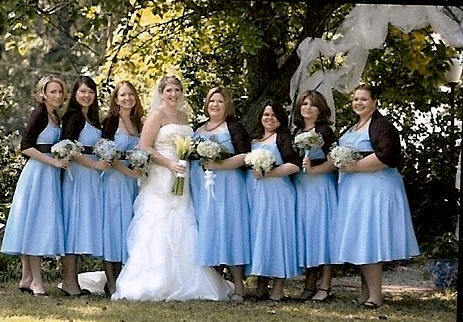 I think she made an excellent choice of dress and they all look beautiful. Andrea, the groom's sister, is missing in this photo. 6. Hair and Make-up—Brooke scheduled two sessions with her hairdresser, Jenna at Tekniques Hair Salon, who came recommended as a specialist in doing hair for weddings. Brooke had done her homework. She brought pictures with her to show the stylist. They experimented at one appointment. The next appointment was for styling Brooke’s hair for her wedding portrait. Jenna also did her makeup. The mother of the bride needs special attention as well. I scheduled an appointment with my hairdresser, Delia at Tekniques, to make sure the hair color was right for the pictures. By then I was looking like a raccoon with circles around my eyes because I was getting up so early every morning and going to bed so late every evening working in the yard and fixing flowers. Jenna came through with an early morning appointment the day of the wedding to do my makeup and cover the raccoon eyes. She worked miracles. 7. Photography—Brooke had no doubt as to whom she wanted to do her photography. 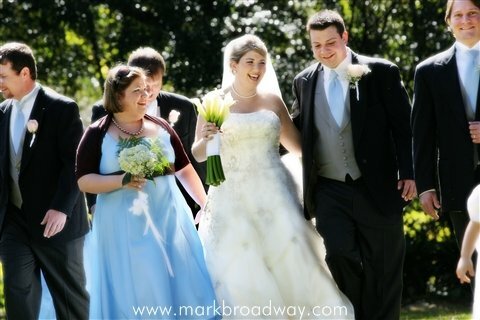 Mark Broadway had done such a magnificent job with her friend Lauren’s wedding that he was the only contender. He is cutting edge and artistic in his wedding compositions and seems to get the best out of the subject. However, even with the very best, one must be vigilant because the best are very busy. On the day of her bridal photos she had her hair and make-up done and took her wedding dress and veil with her to the studio—only to find that Mark was about to go out on another photo shoot, having forgotten her appointment. The point here is to call and confirm every scheduled appointment the day before…like doctors appointments. Even the very best at their profession are just people and things like this happen…but it would have been costly to Brooke in both time and money as she took time off of work for the appointments. It might behoove the photographer to send out reminders like dentists and doctors do to remind both the photographer and the subject of the correct time and place. Also, take time to make a list of the pictures you REALLY want and who is to be in them. Write down the relationships of those people to the bride and then SCHEDULE the time they need to be there. It can be a loose schedule, but do so ahead of time. Give that list to the photographer and he can use his own creativity as to when and where they should appear, but that should be a part of the discussion when the bride and mother of the bride meet with the photographer. Do not take for granted that that will just occur because there can be serious miscommunication as the result. 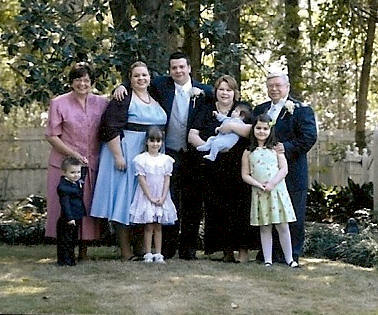 Some of our family pictures did not occur because of such miscommunication. Make sure that a general written "plan" or schedule makes it into the hands of both sides of the family just so they can make sure those individuals are given a "heads up" as to when and where they should be for those photographs. There should be someone who knows both sides of the family well enough to MAKE SURE the photographer gets group photographs of those important people. A close friend or relative could do this. I just did not think about it until we noticed there were some pictures that did not get done. Other of Brooke's friends have commented on this also happening to them so it is apparently a common problem. This should be someone with tact who will not commandeer the creative process, just be observant and available. The photographer is an artist, but the memories are for you. You do not want the photography to interfere with the party and the interaction with guests, but some planning must be done to make sure some special photographs do get taken. Using a chart like this might help organize the "formal" picture taking. List them in groups. If you have a homebound relative as we did...both my mother and father were physically unable to attend...set a time when everyone will gather for a special photo. This happened, but not because I was wise enough to plan for it. 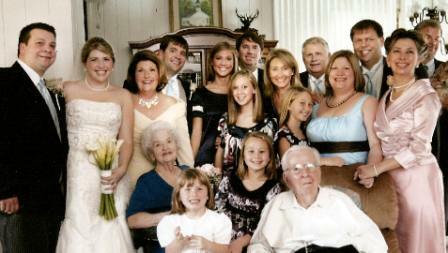 I should have done better and included more family who traveled for the wedding. (I claim stress related dementia.) My sister, Sylvia, and sister-in-law, Debbie, made sure this happened. However, if I had read this article I would have been prepared. 6. Music—Julliard trained guitarist, Rusty Frith, one of Mike’s old friends and the brother of groomsman Lee Frith, played for the wedding and accompanied me in singing "The Lord’s Prayer." Brooke planned and downloaded music on her IPOD and rented sound equipment with Speakers directed throughout the garden for the reception. 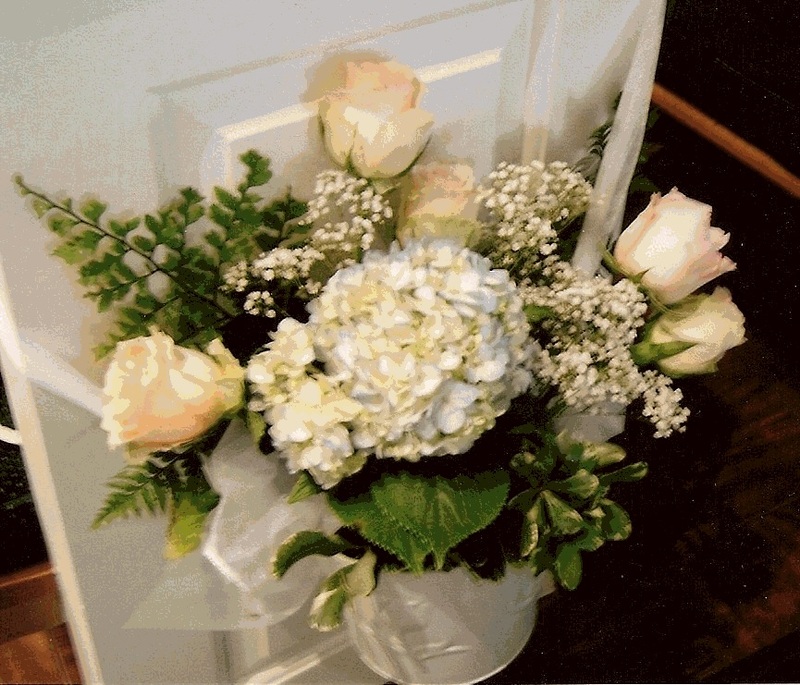 In order to be economical in our flowers, we planned to use the church flowers also as arrangements for home and garden. One must make clear with those who are assigned to bring the flowers back to the house just exactly where they are to go when they arrive at the house. The arrangement for the unity candle also became the centerpiece for the food table laid out under our carport. 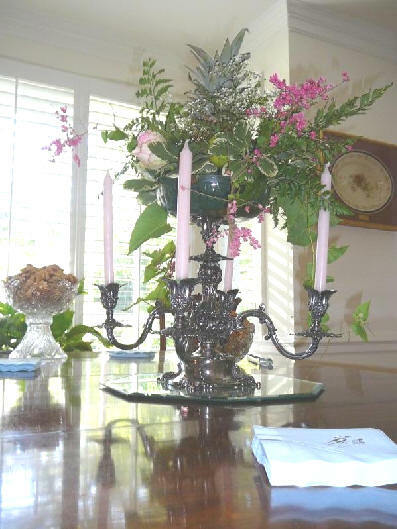 The other altar arrangements, calla lilies and magnolia leaves, were made in antique vases. They later were set in the entry hall and atop the piano. 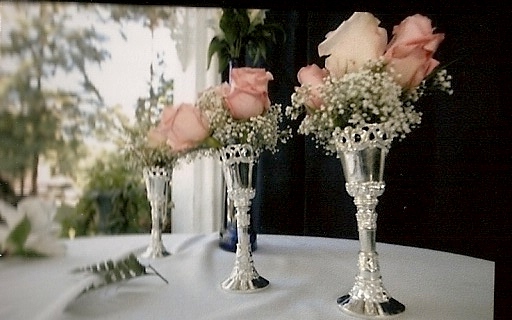 Rather than bows and flowers I created "pew bucket" arrangements that could be used as table arrangements and on the entry gates of the garden after the wedding at the reception. Unfortunately, the temperamental hydrangea withered by the time of the wedding rehearsal. Only a few held up. Before the wedding, my faithful sister-in-law Joyce Ramsey came with me to the church to make repairs. We added roses, fern and gypsophilia and made them prettier than before. As you can see, the First Baptist Church of Dothan, Alabama, was beautiful with the stained glass window lit and the natural light coming in through the windows directed right on the wedding party. This is the church our little girl grew up in, her great grandfather was on the committee to build it, her grandfather served as a deacon at, and her father grew up in. All of that "history" made the day even more special. I can still see her sitting on the lap of "Jesus" in our Christmas musical right at the spot where she stood to take her marriage vows. 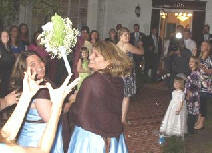 Much more on Flowers under Wedding Raising. 8. Seating –Be aware that the time of year affects the cost of rental. This is something to keep in mind when determining when you will have the wedding. When Brooke set the date of October 27th, the fact that folks would be having Halloween parties at the same time never dawned on us. We did not call the rental people until close to time for the event and were at that time told that we could not have the items sent early because we would be charged for every day we had the chairs or tables…no grace period. That is a real problem when one is decorating for an event because it is nearly impossible to do everything at one time. Fortunately, a friend of mine had chairs, tables, and table cloths that she had on hand for business events and she lent them to me. That was a BIG savings. 9. Insects—Addressing the insect problem in the South is a critical element for a successful outdoor event. I called my friend A.G. Branch with Buzz-Off and he came and sprayed the entire yard. We did not have a single fly or mosquito to deal with. We could have had the wedding cake outside, had we only known how effective that chrysanthemum based spray would be. It is completely human and animal safe, but the bugs are definitely zapped. 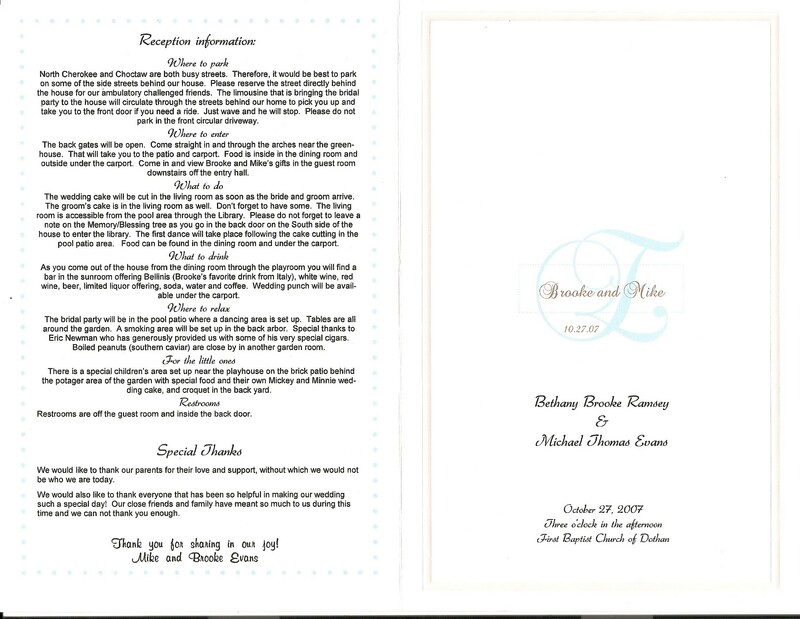 Brooke used the internet wedding sites where brides continue to post even after the big event and found someone who designed the monogram for the front of the program gratuitously. We put information on how to get to our home and logistics for parking and where things could be found at the Reception on the back of the program. 12. Transportation from the church—Where's the limo? We were disappointed with the limousine service that Mike and Brooke hired to bring them from the church to the reception. It was not where it was supposed to be after the wedding and they had to go looking for the limousine. Since there was a minimum time of 2 hours for which they had to be paid, we requested that they travel through the neighborhood where our guests would park and pick up guests who might need a ride and ferry them back to our house. I guess our driver got tired of doing this and came into the house to find out who was to pay him. 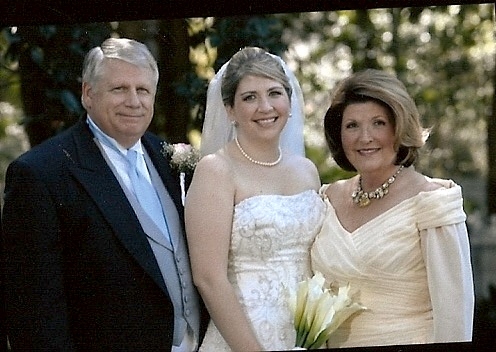 Brooke was involved in the wedding dances but when her father asked her she told him she had left her credit card number with the service and they were to charge that way. The driver just disrupted the reception with something he should have already known and "knocked off" earlier than the time for which he was paid. That was a big disappointment. 13. The grand send-off—Rice, Birdseed or Bubbles? That is the question. We opted for both rice and bubbles. The aunts gathered Thursday night before the wedding and made rice bags. These tulle wrapped rice bags were handed out by our efficient helpers Mary Elle, Mallory and Lily. The bubbles made a beautiful send off from the front walk of our home.